1 + 3 = Required Please enter the correct value. In Dow Jones news today, the Dow pushed higher after Treasury Secretary Steve Mnuchin made a big prediction about tax reform. Mnuchin said tax reform could happen in August, but it might not happen until the end of 2018. Equities continued to rally a day after the U.S. Federal Reserve showed no signs that another interest rate hike was imminent. In addition, a strong uptick in crude oil prices helped propel energy stocks. While the Dow continued its incredible post-election rally, the Nasdaq retreated thanks in part to a 9% slump in NVIDIA Corp. (Nasdaq: NVDA). The Dow Jones Industrial Average gained 34 points after President Trump pledged to bring millions of jobs back to the United States. Despite the pledge to bolster U.S. manufacturing, the president offered few details of his plan. Gold prices added more than 1.3% after the Fed dampened expectations for a rate hike next month. 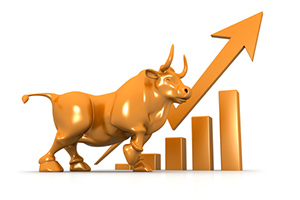 Today's uptick could be the start of something very special for gold investors. We expect gold to rise another more than 12% to $1,400 an ounce by the end of the year. That's why Money Morning Resource Specialist Peter Krauth has put together a list of the best gold stocks to buy in 2017. Crude oil prices rallied Wednesday after the weekly U.S. crude inventory report showed a smaller than expected build in stocks. The Energy Information Administration (EIA) reported that domestic crude supplies increased by 564,000 barrels last week. While the uptick has crude inventories near record levels, traders were more focused on the 1.5-million-barrel draw at the nation's largest delivery hub in Cushing, Okla. The WTI crude oil price today added 1.4%. Brent prices gained another 1.1%. 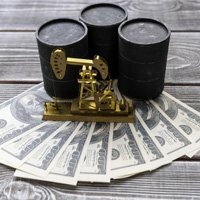 Crude prices still remained near a seven-week high thanks to increased optimism that OPEC members and Russia are on the verge of surpassing the targeted production cuts from the January meeting. The nations agreed to remove 1.8 million barrels per day (bpd) and have reached 90% compliance in a short period. Several prominent analysts have suggested that they could surpass that target in the coming weeks. But the big story is the Snapchat IPO. The New York Stock Exchanged announced Thursday that it will hold a trial run of Snap Inc.'s initial public offering over the weekend. The trial run is in preparation for the largest technology IPO in roughly five years. The exchange wants to test its system by sending a variety of sample orders that it might receive from clients. That's why Money Morning Director of Tech & Venture Capital Research Michael A. Robinson has devised a way for you to make money during the Snapchat IPO that you won't find anywhere else. Here's what you need to know about investing in Snapchat stock. Savvy investors should have eBay Inc. (Nasdaq: EBAY) on their radar. Although the stock was volatile in 2016, we've seen a nice turnaround. EBAY stock is currently trading at roughly $33.60 a share. And its stability offers investors a way to make steady monthly income. It was a tough day for investors of Boston Scientific Corp. (NYSE: BSX). Shares fell more than 2.5% after the firm was forced to recall its Lotus Valve heart devices. The company said that it has experienced problems with the products' locking mechanisms. The recall benefited shares of rival Edwards Lifesciences Corp. (NYSE: EW). Shares of EW stock climbed 3.78%. In earnings news, shares of L Brands Inc. (NYSE: LB) slumped more than 15% after the company reported a large downturn in sales at Victoria's Secret. After the bell, look for additional earnings reports from Baidu Inc. (Nasdaq: BIDU), Splunk Inc. (Nasdaq: SPLK), Nordstrom Inc. (NYSE: JWN), Gap Inc. (NYSE: GPS), Herbalife Ltd. (NYSE: HLF), Intuit Inc. (Nasdaq: INTU), and Brocade Communications Systems Inc. (Nasdaq: BRCD). New Home Sales at 10 a.m.